This volume approaches the UN as a laboratory of religio-political value politics. Over the last two decades religion has acquired increasing influence in international politics, and religious violence and terrorism has attracted much scholarly attention. But there is another parallel development which has gone largely unnoticed, namely the increasing political impact of peaceful religious actors. With several religious actors in one place and interacting under the same conditions, the UN is as a multi-religious society writ small. The contributors to this book analyse the most influential religious actors at the UN (including The Roman Catholic Church; The Organisation of Islamic Countries; the Russian Orthodox Church). Mapping the peaceful political engagements of religious actors; who they are and how they collaborate with each other - whether on an ad hoc basis or by forming more permanent networks - throwing light at the modus operandi of religious actors at the UN; their strategies and motivations. 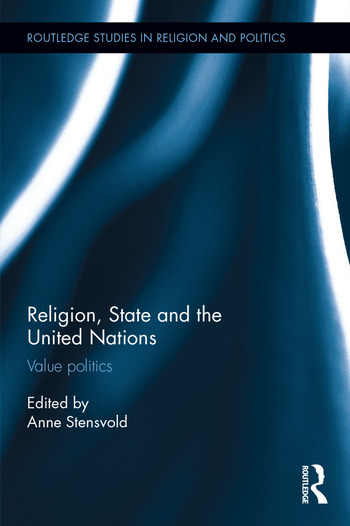 The chapters are closely interrelated through the shared focus on the UN and common theoretical perspectives, and pursue two intertwined aspects of religious value politics, namely the whys and hows of cross-religious cooperation on the one hand, and the interaction between religious actors and states on the other. Drawing together a broad range of experts on religious actors, this work will be of great interest to students and scholars of Religion and Politics, International Relations and the UN. Anne Stensvold is Professor of History of Religions at the University of Oslo, Norway where she leads the Value Politics research group. She has written extensively on popular religion, Catholicism and political aspects of religion, and co-authored Lobbying for faith and family at the United Nations (2013). Her latest book is A history of pregnancy. From Original Sin to contemporary abortion debates. (Routlege 2015).